New poll from Mainstreet this morning. 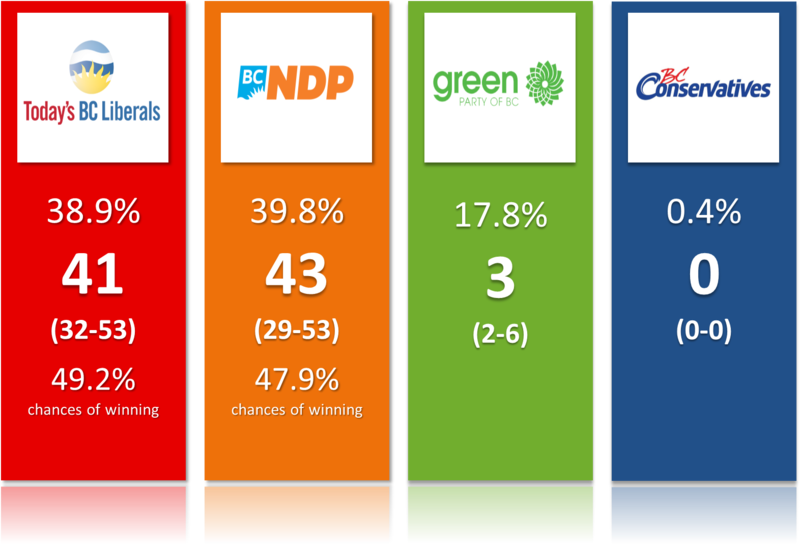 It shows the Liberals rising a little bit and getting closer to the NDP while the Green also gain 2 points. Adding this poll to the average (and discounting the older polls) makes the projections very close between the main two parties. Before we look into the numbers, let's discuss the BC Conservatives. The deadline to be candidate is today at 1pm and as I write these lines, this party officially only has 4 candidates. So let's call a spade a spade: for all intents and purposes, there is NO party named Conservatives in British Columbia. Polls have already shown this party on the decline but it's still way too high. So from now on, I'm adjusting the polling numbers according to the number of candidates. This part is easy and straightforward. The tricky part is: where do these votes go to? And here, there isn't a perfect answer. Mainstreet had asked BC cons voters who they'd support in the eventuality where they couldn't vote for their first choice. Results showed that a good share wouldn't vote (around 30-40%), another good share was undecided while the remaining would, surprisingly, go to the BC NDP and, to a lesser extent, to the BC Liberals and Greens. On the other hand, I looked at the correlations of the various party supports over the last few months and I found that the BC Liberals tended to increase slightly more than the NDP when the Conservatives where decreasing. This correlation was very strong over the last 2 weeks. At the end of the day, I went with the following choice: 30% won't vote, 30% will go to the Liberals, 20% will go to the BC NDP, 10% will stay (for now) and 10% will go to "others". Yes it's pretty arbitrary and yes I could technically base everything on the data from Mainstreet. But this would be based on only one firm with small sample sizes 9for this specific population). And this would ignore my findings with the correlations. And it'd go against the intuition. At the end of the day, I expect the BC Cons to be dropped from the polls very soon and I won't have to deal with this any longer. So anyway, here are the most up to date projections. This is as close as it gets to be a 50-50 race. And yes, as I have explained in the past, the Liberals have higher chances despite being projected with fewer seats. This is because one source of uncertainty comes from the Green. If this party outperforms the polls, it'll take 2-4 seats to the NDP. It's almost perfectly symmetrical. Chances of a minority governments are around 17%. Add the 3% of ties (and a couple of times where one party gets more seats with fewer votes, as shown yesterday) and you have a good 20-25% chance of having a "weird" or complicated results. That is all for now. Later this week I'll try to take a look at what kind of seat distribution we would get by taking into account the number of voters who are strongly committed and the second choices(so how they could ultimately vote). Similar to what I've been doing for the French election. Below you can see the detailed projections.